#600: Hello ... Hello ... my old friends ... It's great to see you once again! ELO Beatles Forever [ELOBF] featured artiste The Trembling Wilburys have today [Monday 14th October] released their debut music video "Handle With Care" to celebrate the 25th anniversary of the issue of the very first single from The Traveling Wilburys back on Monday 17th October 1988. The single reached #21 in the UK Top 75 with a thirteen  week chart run. Their cover of this classic song [see below] is both a credit to this talented London based band and an apt tribute to their [and our] musical heroes. 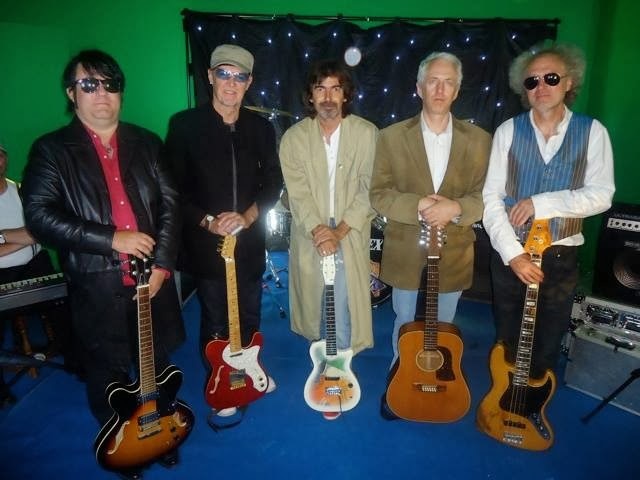 The Trembling Wilburys are: Glen Knowler [as George "Nelson" Harrison], Dave Collison [Roy "Lefty" Orbison], Andy McNish [Bob Dylan/Tom Petty], Marko Laver [as Jeff Lynne], Dzal Martin [lead guitar], Howard Robin [keyboards] and David Stark [as Buster Sidebury a.k.a. Jim Keltner]. ELO Beatles Forever [ELOBF] recommend The Trembling Wilburys to those enlightened folks who enjoy the music of ELO, Jeff Lynne, The Traveling Wilburys, Roy Wood, The Move, The Idle Race, 'Brum Beat', The Beatles and related artistes.